Wesley Snipes just got out of his Comic-Con panel Q&A for the upcoming NBC series, The Player. And while it is a decidedly different kind of drama, one that might not necessarily play to the Comic-Con crowd, fans turned out to hear if Wesley Snipes has any plans to return as his iconic Vampire slayer, Blade. 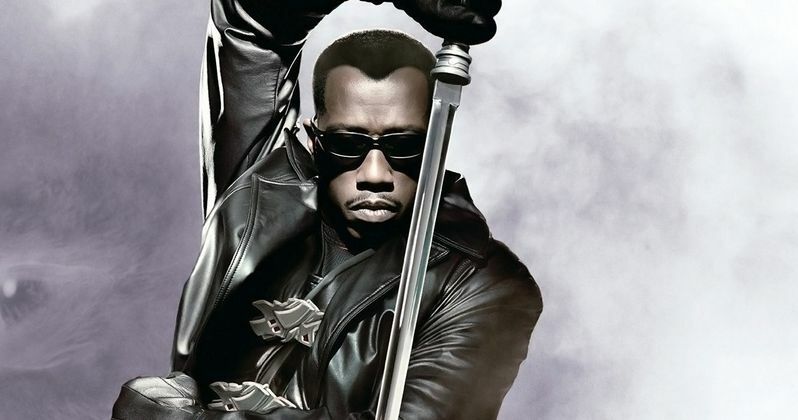 The property reverted back to Marvel over a year ago, and after starring in three sequels, kicking off in 1998 with the original Blade, many have wondered if the actor will return to the franchise. Well, that is as yet undecided. But it sounds like Wesley Snipes, who left the spotlight for a spell after being arrested and jailed for Tax fraud, does want to return. He tells Deadline that talks for Blade 4 have in fact happened. "The project is controlled by Marvel and we did have a really productive and a wonderful meeting and we discussed a number of things. I don't know where it's on their schedule at this point, that hasn't been decided. I guess it's still up in the air." The actor was asked about appearing in other Marvel Studios movies. While he doesn't mention a specific character he'd like to take on, he does hint that he may have a future with Marvel. And if not with them, then possibly a different superhero comics company. He says the following. "That's a possibility too. I've always been a fan of these pieces and adaptations and I'd be nice to be a part of the family again. But if we don't to a Bladeل or something else with Marvel, we'll do something else. We have some other characters and some other concepts that are going to be just as exciting and hopefully just as successful. The first season of The Player will be interesting as well because we have drama and action, which is what I like. It gives me a chance to do a number of different things." The Punisher was recently announced for Marvel's Daredevil, with Jon Bernthal playing the character. Many have speculated that the half vampire-half human Blade will not return in his own solo sequel, but will instead be incorporated into one of the four Netflix series, which also include Marvel's A.K.A. Jessica Jones, Marvel's Iron Fist and Marvel's Luke Cage. Though, it's hard to say whether or not Wesley Snipes would return for a Netflix series, or which particular show would be able to incorporate the character.